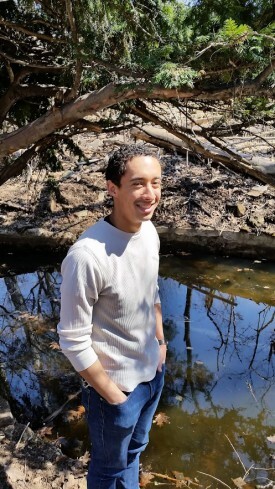 Share the post "Unearthing a Buried Treasure, Part II: Student’s Vision for Trail Renovation Enabled by Fellow Students"
Eliot Nagele (SEBS 2015) stands by one of two man-made ponds that are part of the trail. The Arbor Trail is located behind the University Inn and Conference Center on the Douglass Campus. Rutgers purchased the property in 1965. The Inn is celebrating its 50th anniversary this year and the trail had its grand re-opening on Rutgers Day 2015 on April 25, as part of the Inn’s anniversary celebration. In 1908, armed with a degree in mechanical engineering, young Sydney Bleecker Carpender began his business career with the Brunswick Refrigerating Company, a manufacturer of refrigerating and ice-making machinery. Carpender became the company’s vice-president and general manager in 1911, at age 27. That same year he had a manor built on his family’s property in New Brunswick for him and his wife, the former Louise Johnson, daughter of one of the founding brothers of Johnson & Johnson. A horticultural enthusiast, Carpender created a unique man-made landscape on the estate complete with rolling meadows, ponds and a wooded trail established with select landscape plantings and trees. One hundred years later, another young man came across the wooded trail, its glorious past buried under decades of inattention and debris. 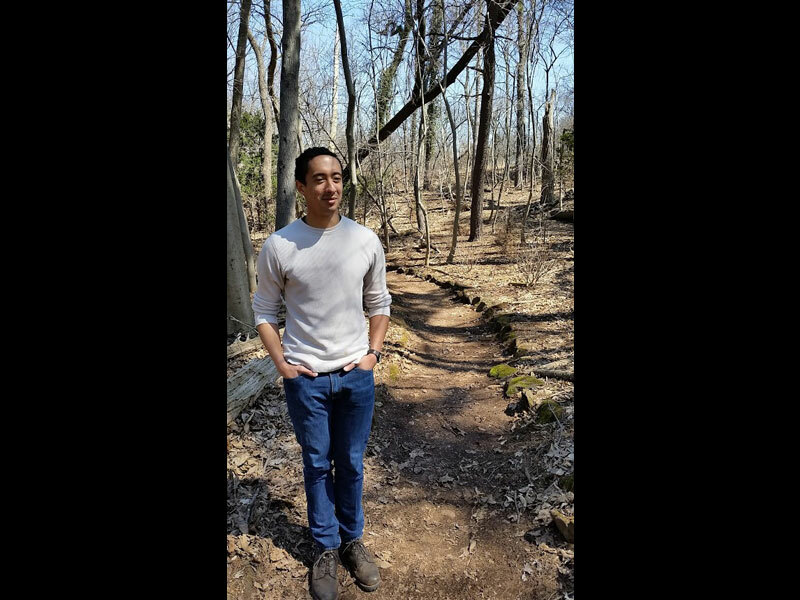 Rutgers environmental planning and design major Eliot Nagele (SEBS 2015) stumbled upon the remnants of the trail when he was cleaning up a nearby creek. Nagele’s venture of taking on the task of renovating the abandoned trail, which began in the spring of 2013, was described in Part I of this story. As Nagele (pronounced Nay-gul) is now in his senior year, it’s time to check in on his progress and see what the trail is like two years after he first rediscovered it. Nagele has bought himself some time to continue his monumental project by completing the certificate of urban forestry program led by Professor Jason Grabosky, which will move his graduation to fall of 2015. The trail has come a long way since Nagele first encountered it: The grounds were littered with downed trees and branches. Invasive species crept through the understory. The two ponds were filled with muck and debris. Except for the trail’s exposed stone borders, the trail itself was indistinguishable from the surrounding woods. As Nagele methodically worked his way through the process of trail renovation, what emerged from the grounds was a landscape of possibilities. After the initial clean-up and Nagele conducted an inventory/mapping of the plantings, he could envision multiple uses for the site, and ways to enhance the setting through new plantings. As he set about accomplishing the envisioned tasks, Nagele became as astute a manager of human resources as he was of natural resources – each presenting their own set of challenges. Managing the natural resources requires vigilance, as Nagele affirms, “Every year it needs consistent maintenance.” The severe winter took its toll and the trail underwent more deer browsing than usual, as was the case for nearby Rutgers Gardens. Although the trees downed from prior hurricanes had been cleared, this winter’s heavy snow melt/freeze cycle heaved a huge tree across the lower path that had most recently been cleared. Some of the newer plantings that were put in last spring but didn’t get watered the full length of the summer died. But just as these natural resources present their challenges, they also demonstrate their splendor. Early spring revealed patches of blooming white snowdrops planted by Carpender along the upper trail, and yellow winter aconite along the lower trail. These made way for daffodils and other spring flowers that may have been planted closer to the manor but spread down the hill. Rhododendrons, azaleas and mountain laurels that were planted last spring continue the seasonal parade of color. Before the canopy of leaves fills in for the summer, the once blackened ponds now reflect the blue sky. Early spring 2015. The trail has come a long way, but Eliot Nagele still has further plans to recreate an outdoor classroom. Similarly, the human resources Nagele managed presented both challenges and rewards. No classroom experience would have taught Nagele a lesson in life as he’s gotten from working on the trail. Getting university support for the project was not a problem, it was maintaining the momentum that proved challenging. “My original vision was that the university or someone would take it on more so, but no one seems to be stepping up and it is more me running from person to person.” Nagele came up with a strategy to keep things in motion – he would get other students to take on projects. This effort has proven fruitful. Nagele has recruited student volunteers for clean-ups and plantings, and has cooperated with several classes to incorporate student involvement, as well as involving a few graduate students to conduct independent projects. Professor Jason Grabosky’s Urban Forestry class performed invasive species removal. Volunteers primarily from Department of Landscape Architecture (LA) Instructor Frank Gallagher’s Environmental Issues class removed invasive species, worked on trail maintenance and prepared the site for Rutgers Day. A 2014 Arbor Day planting of 200 trees and shrubs drew 100 volunteers, mostly students. Nagele is especially impressed with the evolution of the Arbor Day planting. The planting plan was based on the designs of two graduate students, Arianna L. De Vries (MLA, 2014) and Andrew D. Op’t Hof (MLA, 2014). “It was for a graduate student class in Landscape Architecture. They had to do a design in different spaces. Many of the students chose parks on campus and two students chose the trail site. The professor thought their designs were good enough and wanted to provide an incentive to take design seriously,” explains Nagele. Another faculty member who had received grant money to plant trees on campus agreed to implement their designs and funded the purchase of the plants. Nagele’s efforts to engage students continues. Readying it for Rutgers Day, he worked with Andrew Schlesinger (MLA 2016) on signage for the site, and is working with George Brnilovich (BSLA 2015) on acquiring 50 plants for a planting event after Rutgers Day, which is being supported financially by Jason Grabosky. The Arbor Trail brochure, created in 1976 by then Cook College student Roy K. DeBoer. Click on image to view the entire brochure. As Nagele and volunteers have toiled at the site hidden behind the University Inn, a fresh landscape has emerged that will hopefully bring the members of the School of Environmental and Biological Sciences community and others in the public out onto the grounds to learn about nature and enjoy the pastoral setting. Much of Nagele’s vision involves restoring the site to its former use as an outdoor classroom as it was in the1970s through 80s when the School was Cook College. It was then known as the Arbor Trail, maintained by Alpha Zeta service fraternity and other Cook students, and was overseen by now retired LA Professor Bruce “Doc” Hamilton. A hand-drawn trail guide was developed by the late Professor Roy DeBoer’s son, then LA student, now LA instructor, Roy K. DeBoer (see side story on the Arbor Trail). Nagele sees many features as useful for outdoor education, right down to the remaining tree debris. Rather than view the remains of downed trees in the woods as an eyesore, Nagele explains, “For the site to be an educational resource, it provides opportunity for classes to learn about different fungi and pathologies.” His plan for the summer is to have the trail come through to the adjoining meadows. The meadows are left to grow during the season, so if they are cut around the perimeter it would provide a place for studying meadow ecology or just observing birds and butterflies. A potential class project for LA construction classes could be refurbishing the water features that drain from the Inn to the ponds. While these are all Nagele’s ideas for potential use, an LA student is currently working on documenting outdoor classroom spaces on the G.H. Cook Campus and is including the site as a case study. Below is Nagele’s timeline of work accomplished on the trail. Organized Arbor Day planting of 200 trees and shrubs, drawing 100 volunteers. Currently working with George Brnilovich on acquiring 50 plants for a planting event after Rutgers Day. Supported financially by Jason Grabosky. Tentatively complete my G. H. Cook Scholars Thesis. Project focused on creating a management plan for the revitalization of the Arbor Trail. Mainly focused on developing the social structure and frame work through which faculty, staff, and students can ensure the development of the site. Read more: plaque marking the trail dedication ceremony.